CyberPowerPC wants to gift one of their fans with brand new custom made gaming PC case! 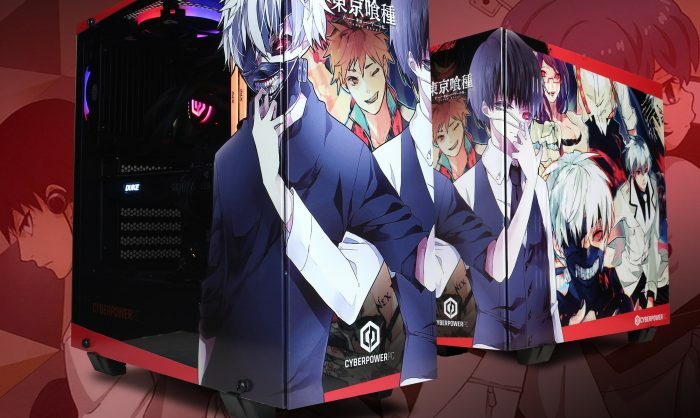 To enter in this CyberPowerPC Tokyo Ghoul Wrapped PC Case Giveaway grab your free entries by following few simple steps listed down below! The Inferno 310 is the hottest new case in our lineup, as it is geared towards users who want a lot of flare and style in their rig. With a sleek and sturdy tempered glass side panel, the case allows for easy viewing of the inner components. For those RGB fanatics, the Inferno 310 includes two of our Hurricane RGB fans, an RGB strip on the front panel, and an RGB AZZA logo on the power supply chamber, all fully customizable, allowing you to make this case truly yours. With a metal front door panel, the case features a sturdy design that is suited for all users. The Inferno 310 supports a 360mm water cooling radiator on the top, as well as a 280mm one on the front. The Inferno 310 supports the longest video cards in the market, up to 380mm long. The power supply is housed inside its own isolated chamber, preventing the residual heat from the power supply from affecting the other components.